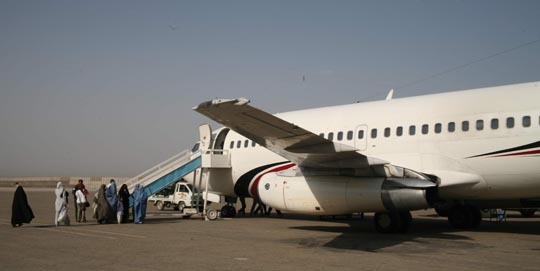 ▲ boarding a very elderly Kam Air 737-200 in Herat, Afghanistan in 2006. Note the skinny engines. Thought One: The 737 Max is less aerodynamically stable than its 737 NG (Next Generation) predecessors, like the 737-800. Essentially that’s because the 737 is too close to the ground to mount the engines in an ideal position. And that’s because the 737 first flew in 1967 with Pratt & Whitney JT-8 engines which had a fan diameter of 125cm. The CFM International LEAP-1B engines on the 737 Max have a fan diameter of 175cm. They simply do not fit so easily under the wing. Airbus don’t have the same problem because their competitive aircraft, the A320 series, didn’t take flight until 20 years later in 1987. So it had longer undercarriage and there’s more ground clearance under the wings. The A320 equivalent of the 737 Max is the A320neo for ‘new engine option.’ An Economist story in their 22 March 2019 issue sums the 737 Max problem up. Thought Two: It’s been suggested that the relationship between the FAA (Federal Aviation Administration) and Boeing is altogether too cosy and if the FAA had really been doing its job they would have required additional training for 737 Max pilots, particularly for the MCAS (Maneuvering Characteristics Augmentation System) software which may be the cause of both crashes. Most aviation administrations went along with the Boeing and FAA belief that additional training was not required. One country that didn’t? Brazil. And déjà vu? The DC-10 cargo door fiasco in the 1970s. The FAA and McDonnell Douglas knew the cargo door was dangerous, but they had a ‘gentleman’s agreement’ which avoided fixing it properly. There had been a cargo door failure in ground testing in July 1970. Then in June 1972 American Airlines flight 96 – the ‘Windsor Incident’ – miraculously avoided crashing but underlined the severe danger. As a result Dan Applegate – Director of Product Engineering at Convair which made the cargo door for McDonnell Douglas – reported that this was a disaster waiting to happen and it should absolutely be fixed. His report went out two weeks after the 1972 ‘Windsor Incident,’ but he was ignored although his name comes up in assorted ‘ethics and engineering’ stories. He was absolutely correct because on 3 March 1974 a third DC-10 cargo door failed, this time it brought down Turkish Airlines flight 981 and 346 people died. Coincidentally precisely the same number who died on the two 737 Max crashes.